Lying amongst the shards of wood on an abandoned estate in north London are a rusty electric iron, the mouthpiece of a recorder, and a child's water pistol: the domestic paraphernalia of once settled lives. Just two families cling on here. 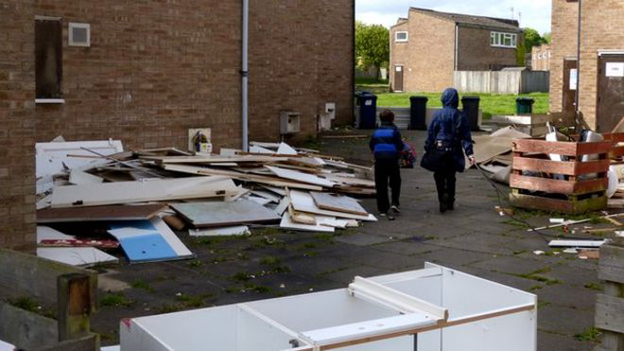 The tenants of the other 140 houses have been evicted over the last five months, to make way for a private development. "It breaks my heart to come back here, to see it like this," says Juliet Azie, a single mother, between tears. We are standing outside a house in Barnet, where, until last month, she looked after her four children. "We miss our home; we miss our neighbours - and my kids long for a home again," she says. Councils have an obligation to re-house their tenants and since Easter the family has been in temporary accommodation in Potters Bar in Hertfordshire, six miles away. According to figures obtained by The Independent newspaper, Juliet is one of more than 50,000 people made homeless who have been forced to move out of their London boroughs in the last three years. The BBC understands that more than 2,000 have had to leave London altogether. Many families - often mothers and children - say they cannot afford council rents, citing factors like the benefits cap and stagnating real wages. And equally, rising rents mean that local authorities cannot afford to subsidise temporary accommodation nearby, so they are left with no choice but to send tenants elsewhere. 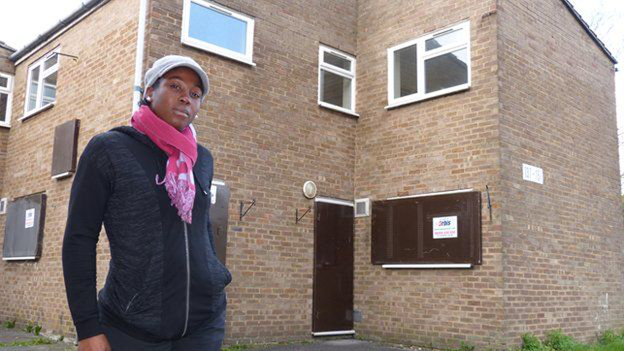 Annington Homes, which is developing the Sweets Way estate in Barnet, where Juliet Azie used to live, says that all the tenants were warned when they moved there that it was only a temporary solution. However, the families say being moved out of the area can be difficult. Juliet's four children are still at school in her old neighbourhood in London. She also works at a DIY store a five minute walk from her previous home. The twice-daily round trip now costs her £240 a month in petrol. She also pays £268 a month to keep her furniture in storage. Those two expenses alone use up half of her £13,000 salary. But having refused a previous offer of a house on the grounds of distance, she is classified as "intentionally homeless". When her emergency accommodation runs out, she fears her children could even be put into care. "I'm so scared they're going to take my kids. They have already sent the details to social services," she says. Barnet Council said they could not comment on individual cases, but confirmed that those who refuse one offer of alternative accommodation are excluded from the register for two years. Like every London council, Barnet offers incentives for tenants to leave. Earlier this month Wandsworth, for example, admitted that it was offering grants of up to £7,000 to anyone prepared to move to Birmingham, where rents are cheaper. Others are being offered homes even further away from their roots. Suzanna (not her real name) is a 35 year-old single mother who has lived all her life in west London. Having been evicted, she is currently sleeping on a friend's sofa, along with her two year-old son. Despite the fact that she cares for her disabled mother, the only home she has been offered is in Leeds, 195 miles away. "I was devastated by that. I don't believe they can't find somewhere more local than Leeds. My mum is paralysed on one side, and I have to look after her," she says. The councils believe that the underlying problem is the lack of houses being built. They say the right to buy programme has also limited the supply of homes for rent, over the years. Barnet, for example, told the BBC that in the last three years there has been a 47% reduction in the number of social lettings available. As far as people like Suzanna are concerned, councils say they try to house people as near as possible to where they live, but that isn't always affordable. 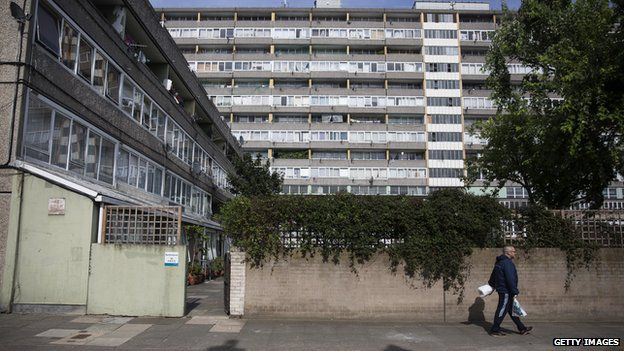 "Councils are facing huge challenges in finding affordable temporary accommodation in the capital in the context of a very pressured property market and shortage of housing in London," said a spokesperson for London Councils, the cross-party body that represents the boroughs. 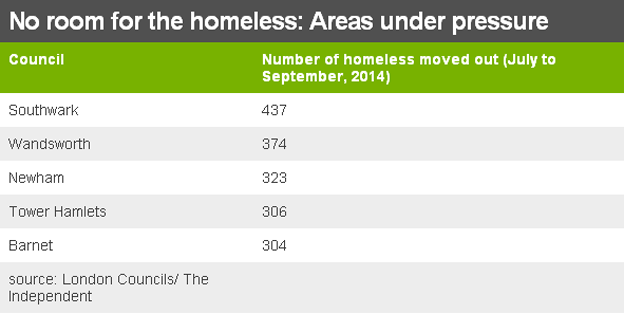 Housing charities also argue that more public sector housing is key. "It's the housing shortage that has created this crisis, and the only way to escape it for good is for the government to build the affordable homes we so desperately need," concludes Campbell Robb, the chief executive of the housing charity Shelter. But after years of councils not building, there are signs that may be starting to change. The government has granted 36 councils limited borrowing powers, as part of a programme which should allow local authorities to build an extra 3,000 affordable homes. "Affordable" means it can be rented out at 80% of market value, or 65% in London. Councils in London are keen to start building again, but they want limits on borrowing - the so-called housing borrowing cap - removed first. So far the government has refused to do that. Last year in England there were just 25,100 homes built by councils or housing associations. That is against an estimate of 78,500 affordable homes that are needed in England each year, according to a report written by the late Dr Alan Holmans for the Town and Country Planning Association. Back in Barnet, Annington Homes has promised there will eventually be twice as many homes as there used to be on the old estate, and that 20% of them will be affordable. But with house prices in London continuing to rise at an average rate of 11% per year, according to Land Registry figures, the former occupants are unlikely to be able to afford to buy, or part-buy, one of the new homes. Certainly Juliet does not expect to be moving back to the area soon - which she says is a problem for the local economy as well as her. "If they push us out, who is going to do our jobs?" asks Juliet. "Who is going to serve you on the High Street? Who is going to look after your old people?"